The comment was condemned by MPs of all political stripes. Conservative Leader Andrew Scheer apologized to Environment Minister Catherine McKenna after a Tory MP referred to her as "climate Barbie" on Twitter. 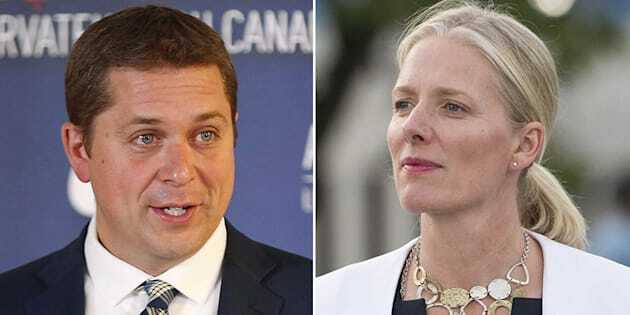 OTTAWA — Conservative Leader Andrew Scheer has personally apologized to Environment Minister Catherine McKenna for a Tory MP's remark referring to her as "climate Barbie." Scheer called McKenna on Thursday to offer the apology two days after Saskatchewan MP Gerry Ritz posted the insult on Twitter. McKenna, who is in New York for Climate Week NYC, said she is fed up with having to respond to sexist insults that take away from the work she is doing. A spokeswoman for McKenna says the minister accepted the apology and told Scheer she hopes to see "a shift in behaviour and attitudes in politics." After a social media backlash, Ritz deleted the tweet and apologized on Twitter, but has not yet spoken to McKenna. The Ritz incident and an ongoing issue with Conservative Sen. Lynn Beyak's comments about First Nations, served as a distraction for the Conservatives in a week where the focus was supposed to be on proposed Liberal tax changes. The Conservatives removed Beyak from her three Senate committee positions on Thursday, though she remains a member of the Conservative caucus. In this day and age, when an obvious mistake has been made, you don't have the luxury to ponder it. She is in hot water for the second time this year over comments about Indigenous People. In the spring she said residential schools did a lot of good and most recently she advised First Nations people to tear up their status cards and practise their culture on "their own dime." Conservative Senate leader Larry Smith issued a statement on his website saying Beyak had been issued "a set of measures to guide" her but he didn't elaborate and says he considers the matter now closed. Conservative strategist Tim Powers, vice-president of Summa Strategies, said Scheer is doing the right things, but he's taking too long to do them. "In this day and age, when an obvious mistake has been made, you don't have the luxury to ponder it," said Powers. "I think he's got to look at this and his team has to look at this as a learning moment." Powers said Scheer may have been struggling with what to do in both instances because he places a high priority on free speech. Conservative MP Gerry Ritz deleted his comment on Twitter and apologized. One of his campaign promises during the Conservative leadership race was a threat to cut federal funding for any university that denies certain groups the right to be heard on campus. He pointed to some universities where anti-abortion rallies were cancelled after other students objected. Powers said Scheer has to come to terms with what is freedom of speech in a difference of opinion about sensitive issues and what is "torqued, offensive political rhetoric." "If you're trying to stretch it, you can make a free speech argument, but it's the free speech of the 1940s and 1950s not 2017," he said. "I think it's important for Andrew to find some resolution to this quickly." Scheer's spokesman said the university freedom of speech policy and the Beyak and Ritz situations were "apples and oranges." Powers also noted however that the Liberals have to be careful not to take the Ritz thing too far, suggesting a fundraising letter McKenna sent out based on the comments was an overreach. The Liberals are demanding that Scheer force Ritz to apologize in the House of Commons but that seems unlikely. Ritz doesn't intend to take his seat in the House of Commons before he retires on Oct. 2.